In the fourth and final tutorial in the series about coding an Angular app with a PHP backend, you will learn how to delete an item with the Angular HttpClientModule's delete() method. In the previous tutorials, you learned how to fetch a list of items from the PHP backend, how to post a new item to be stored in the database, and how to update an existing item. Remember the list that shows the names and prices of the list of cars and enables the editing of each car item (if not, you better start by reading the first tutorial in the series). In this tutorial, we will give the list the ability to delete items by adding a delete button. Angular prints each car item to a separate line of the list. Clicking the "delete" button sends the id of the item to be deleted to the service. Add the method deleteCar() to the component. The method gets the id from the form and subscribes to the delete() method in the service. You need to subscribe since the delete() method in the service is an observable. Add the delete() method to the service. The method gets the id from the component before sending it to the PHP backend with the HttpClientModule's delete() method. Angular httpClientModule's delete() method accepts the URL as the first parameter and the data (id) as the second. In the case of success, the delete() method needs to return the updated list of cars, without the deleted car. The filter function returns all of the cars except for the deleted car. The handleError method goes into action in the case of an error. In case of error, the code returns a response code from the 400 family (Not sure what it means? read the tutorial about REST API). In the case of success, a response code 204 is returned, which indicates that the operation was successful but no data is returned in the payload (response body). 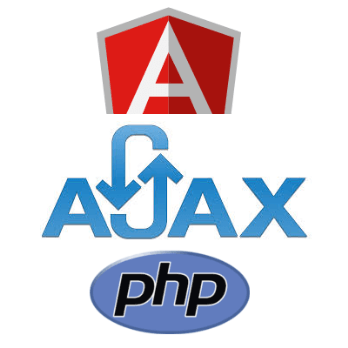 That concludes the series of tutorials about developing an Angular app with a PHP backend. We learned quite a lot. Including how to perform the CRUD operations (Create, Read, Update, Delete) with Angular's HttpClientModule, and how to consume an API which is based on the REST architecture. You can make this code suitable for more elaborate needs by separating the CRUD operations into different components, giving it the ability to work with files and images, as well as consuming API which comes from a source that requires authentication, such as a Laravel-JWT app.